The announcement of the partial Maliki II government on 21 December has transformed Iraqi politics into something of a chaotic construction site. As of today, no one knows who will be in government or how many ministers will eventually be named. Additionally, due to the stream of deputies hastily leaving parliament in search of greener pastures in the executive branch of government, no one any longer has a complete list of deputies. Based on lists of new ministers and old deputies it is clear that at least 20 of the 325 deputies in Iraqi parliament will need replacement, probably with more to come as ministries held as deputyships by existing ministers will get distributed. As of today, the Kurds have yet to name any replacements (and have also yet to name several of their ministers), and Iraqiyya has apparently named only around half of their 7 replacements. Some glaring errors in the way the names of new deputies have been rendered in official statements from the Iraqi parliament also make analysis of the information released so far somewhat problematic. Still, around a dozen of the replacements can be identified with reasonable certainty, as indicated in the table below. The legal framework governing these replacements is a law on replacement of parliamentary deputies from 2006. It has not been adjusted to the realities of an open-list system, and basically leaves it to the relevant party leaderships to find a replacement candidate from the non-winning candidates – in the case of governorate seats (i.e. the 310 seats allocated to governorates) it should be someone from the same governorate; if it relates to one of the seven compensation seats, it does not matter where the replacement comes from. The women quota can be ignored, but the law makes a mess of the terminology when it comes to the question of bloc versus registered entity as the relevant framework for making the replacement: It mixes up “bloc” (kutla), “list” (qa’ima) and “entity” (kiyan) within the same paragraph, thus making it unclear what basic unit shall be used as point of departure for reckoning the potential candidates for replacement. That in turn highlights the numerous problems and indeed constitutional infractions that have been committed through the replacement so far. Of the players involved, State of Law seems to be following the rules reasonably well, with replacement candidates apparently being brought in from the relevant governorates from which ministers were recruited. Additionally, Jasim Muhammad Jaafar had been given a compensation seat so he can be replaced by a candidate from anywhere in the country. Fewer replacement candidates are known for Iraqiyya but legally they seem fine so far, and one wonders whether perhaps the new deputy reported as Abbad Khalaf Muhammad in the parliamentary records might in fact refer to Abdallah Khalaf Muhammad of Iraqiyya from Kirkuk. On the other hand, there are problems with the way in which both the Sadrists and Fadila apparently have brought in people from other governorates (Karbala and Dahuk) to replace some of their Baghdad candidates. If true, that would be unconstitutional since the principle of 1 deputy per 100,000 Iraqis would be in jeopardy. 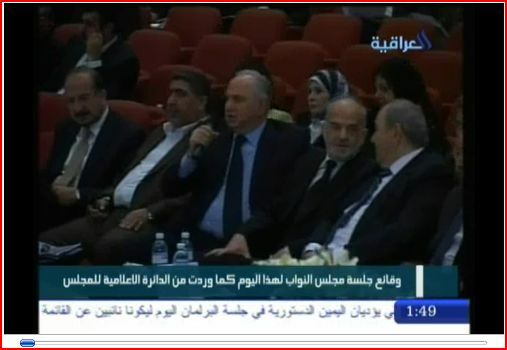 In particular, one wonders about bringing in Jawad Ali Ghanim with no more than 3 personal votes in Dahuk! The same problems apply to some of the replacements for Unity of Iraq and Tawafuq which have more recently joined to form a single parliamentary bloc. Already there have been protests in Salahaddin about the way in which Jawad al-Bulani, the interior minister and a Baghdad candidate for the Iraqi Constitutional Party within Unity of Iraq, was given a replacement seat for Ali al-Sajri of the “People’s Current” within Unity of Iraq in Salahaddin governorate. The same kind of reactions have materialised regarding Salim al-Jibburi, a Diyala candidate, although it is noteworthy that this replacement is not due to anyone becoming a minister but rather relates to the retirement of Usama al-Tikriti of the Iraqi Islamic Party in Salahaddin. The first of these cases, i.e. that of Bulani, not only touches on the governorate balance but also on the perpetual question of the coherence of the parliamentary blocs: Wasat had just been formed from Unity of Iraq and Tawafuq, but here the constituent parts of Unity of Iraq are quarrelling among themselves! Iraqiyya Not Such a Big Bloc After All? The past couple of days have seen two developments in Iraqi politics that haven’t quite received the attention that they deserve. Firstly, as at least some of the media has noted, the all-Shiite National Alliance (NA) that leads the new Maliki government has selected Ibrahim al-Jaafari as leader of its parliamentary bloc. Many would say it was an obvious choice: Jaafari was reportedly favoured as premier candidate by both the Sadrists and Iran before Maliki managed to sway those forces behind himself instead. At the recent meeting of parliament where the new government was sworn it, Jaafari held a longish speech that seemed a little out of place at the beginning of the ceremony as if he was screaming for a role beyond that of an ordinary deputy: He may now have found it. Even less noticed is the fact that the Nujayfi bloc of Iraqiyya, also known as “Iraqiyyun” (“Iraqis”), has elected Hasan Khalaf al-Jibburi to head their parliamentary faction of around 10 deputies (they sometimes claim as many as 20). This is interesting for several reasons. Firstly, the reason NA has gone out of its way to elect a single leader is the fact that it needed to do a merger between Maliki’s State of Law (89 deputies) and the Sadrists (40 deputies) to grow in size and trump the argument by Iraqiyya that it was the biggest bloc in parliament as it emerged from the elections with 91 deputies. Having lost that contest, it now appears Iraqiyya leaders are happy to revert to their constituent elements, and it will be interesting to see whether others (Hashemi, Eisawi, Karbuli, Mutlak etc.) will follow Nujayfi’s lead or stay loyal to Ayad Allawi. A second interesting question is whether the grey-zone elements on the margins of the National Alliance, such as Fadila and ISCI, will fall in line with the rest of the Shiites or form their own smaller parliamentary blocs on the Iraqiyyun pattern.Regardless of the eventual outcome, the idea of a single parliamentary leader as a defining criterion for constituting a parliamentary bloc or kutla seems reaffirmed by these developments. 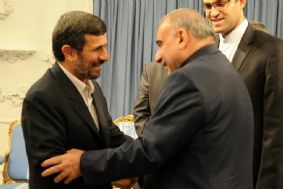 Abd al-Mahdi in Tehran: Who Is Paying for This? 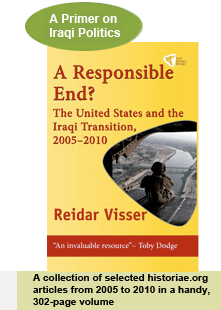 Those who prefer to adopt a jubilant narrative on the wonderful successes of Iraq in the post-2003 period often dwell at the supposed brilliance of the new, free press in the country. Free it may well be, at least to some extent, but competent it surely isn’t. Take its collective failure when it comes to detecting some of the serious fraud involved in the illegal multiplication of vice-presidents of the country in the past two months. When Jalal Talabani was elected as president on 11 November this year without deputies, his two previous deputies, Adel Abd al-Mahdi of ISCI and Tariq al-Hashemi of Iraqiyya automatically lost their jobs. The reason for this is simple: The transitional presidency that lasted from 2005 and 2010 and the ordinary presidency are two entirely different political institutions: The first was a powerful instrument of consociational democracy that featured significant veto powers; the second is an ornamental institution only with largely ceremonial powers and no right to veto anything. No vice-presidents were elected on 11 November because the law for electing the presidential deputies has yet to be adopted. Unlike the modalities for electing the president – which have been spelt out in the constitution and made it possible to move ahead with the election of Talabani even though this too was legally somewhat dubious since no special law for electing him had been passed – neither the number nor the powers of the vice-presidents (not to speak of the method for their election) have been hammered out in the constitution. A law on the subject is currently snaking its way through parliament, with suggestions that there may be three or four deputies to Talabani in the next cycle. Like Talabani himself they will play a symbolic role only, but as of today the law has yet to be passed. Despite this situation, Iraqi media keep referring to Adil Abd al-Mahdi and Tariq al-Hashemi as if they were still vice-presidents! For example, in a press release after the recent visit by Abd al-Mahdi to Tehran, Iraqi media covered the event as a visit by an Iraqi vice-president, echoing the tone of the press release from Abd al-Mahdi’s own office. وقال بيان لمكتب عبد المهدي :” ان نائب رئيس الجمهورية التقى في طهران امس رئيس جمهورية ايران الاسلامية محمود احمدي نجاد ، حيث قدم الرئيس الايراني في بداية اللقاء التهاني والتبريكات بمناسبة تشكيل الحكومة العراقية الجديدة ، معتبرا ذلك خطوة مهمة لتحقيق الامن والاستقرار في العراق والمنطقة عموما “. Of course, the fact that his office keeps referring to Abd al-Mahdi in this way may simply be down to sheer hubris among his staff. But the failure of the Iraqi press to detect the problem is more serious and relates to a fundamental failure in understanding the nature of the political system in the country. Not least, it begs the question of who paid for the trip! It may well be that Abd al-Mahdi eventually gets elected as (ordinary) vice-president, perhaps already in a few weeks’ time. But right now, unless he has taken the oath as an ordinary deputy of parliament, he is a private citizen. In times of austerity the Iraqi electorate has the right to know whether government funds are being used to finance travel activity on the part of non-existing vice presidents or not. Makki’s comments are of course eminently relevant also with respect to another process in which his own Iraqiyya is taking part these days: The enduring Iraqi government-formation saga. With the vote in Iraqi parliament today in favour of around 35 ministers that will serve in the next government of Prime Minister Nuri al-Maliki, it seems clear that the goal of satisfying narrow party interests has taken precedence over the idea of creating governance for Iraq… Full story here. UPDATE 20 December 2010: Maliki will reportedly present a partial list of ministers to the Iraqi parliament this afternoon at 4 PM Baghdad time. UPDATE (2) Maliki may meet Nujayfi tonight but no parliamentary action on the candidates is exptected until tomorrow, at the earliest. After a stormy session in the Iraqi parliament today which saw both the lifting of de-Baathification measures against three members of Iraqiyya and the withdrawal of Kurdish deputies in protest against the first reading of the budget, it seems as if Nuri al-Maliki, once more, is on track with his agenda for the next government. One of the least noticed items of important news out of Iraq so far is a statement by Safa al-Din al-Safi that Maliki intends to present his cabinet early next week. Before he does that, it will be interesting to follow the recalibration of parliamentary factionalism that is necessary in order for the next government to achieve the 163 votes it needs. For Iraqiyya, the outcome of today’s session was a mixed bag. The acquittal of Salih al-Mutlak, Zafir al-Ani and Jamal al-Karbuli was logical in so far that their de-Baathification appeared questionable in the first place; however the way it was done today was decidedly messy. By lifting the sanctions against the three, parliament was acting in an extrajudicial way, reportedly on the basis of signed letters in which the three members disavowed any links with the Baath party (some reports suggest a fourth member, Rasim al-Awwadi, failed to produce this kind of letter). A more proper course of action by parliament would have been to sack the de-Baathification committee, enact legislation under chapter 7 of the constitution, or revise the accountability and justice law of 2008. Conversely, by infringing on the authority of the judiciary, it produced a decision that smacks of cliquishness in its narrow focus on three privileged members of Iraqiyya. What about the thousands of other Iraqis that have been targeted by the de-Baathification committee without due process? Be that as it may, one does get the impression that Iraqiyya leaders are increasingly coming to terms with the prospect of a second Maliki premiership. In so doing, they appear to be following their own agenda rather than the American one, which was always focused on some kind of formal power-sharing through the presidency or more recently via the elusive “national council for high/strategic/whatever policies”. With Maliki possibly pressing for a vote on the next government as early as next week, the prospect of legislating the American-sponsored council before the vote seems increasingly unrealistic – a tendency that was just strengthened by the, um, American-led initiative to pour praise on Maliki in the UN Security Council recently. Symptomatically, perhaps, Rafi al-Eisawi of Iraqiyya was reported as having discussed the proposed law for the council with the US ambassador last week; a more realistic course of action, on his part, would of course have been to engage National Alliance leaders close to Maliki on the subject. يحيل رئيس مجلس النواب مشروعات القوانين المقدمة من السلطة التنفيذية الى اللجان المختصة، لدراستها وأبداء الرأي فيها قبل عرضها على المجلس لمناقشتها على ان يجري ذلك بحضور ممثل عن اللجنة مقدمة المشروع. 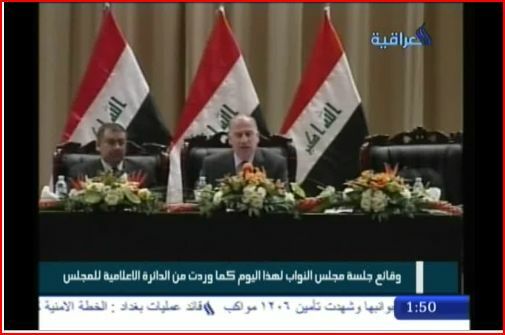 Politically, of course, it is more interesting that Nujayfi of Iraqiyya proceeded to overrule the Kurdish representative Khalid Shwani on this point and let Baqir Solagh, the outgoing finance minister of ISCI, proceed with reading the draft budget without the Kurdish deputy speaker present on his left hand. In some ways, the sudden tendency of National Alliance leaders over the past few weeks to focus on the constitutional deadline for forming the government (which expires on 24 December) seemed to suggest that it was moving ahead to pre-empt any bids by Iraqiyya to legislate the council for national and instead rely on the “political majority” concept to simply reach the 163 threshold. Today’s developments, the apparent tendency of Iraqiyya leaders to be satisfied with less, and even rumours that Hussein al-Shahristani may keep the oil minister job in the next government all raise the question of whether Iraqiyya or the Kurds will be the main contributor to that majority. That in turn, of course, would inevitably prompt another question: Does Maliki really need all the 30 plus ministers that are currently under discussion when he theoretically has the option of forming a governance-oriented majority instead?